4 BRAND NEW SHADES TO BREAK IT UP! 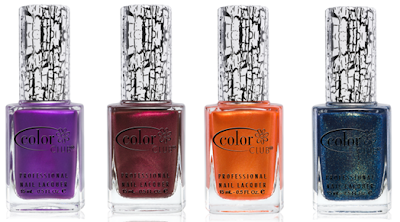 New York, NY – October 2011 - From New York-based veteran nail polish brand Color Club, are four new beautiful shades that BREAK the mold. From left to right: Do You Want a Piece? Burgandy Burst, Explosion and The Great Divide. Look out for these brand new Fractured shades coming soon on www.shopcolorclub.com and also in stores at your local retailer. 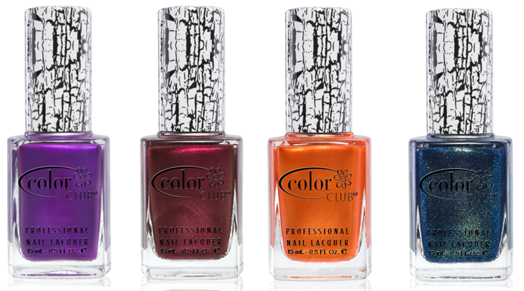 A favorite of celebrity manicurists and nail color fans worldwide, Color Club is renowned for its high performance rich shades and exceptionally safe products. From the brightest neons to glitter and French, all nail colors are vegan, Formaldehyde, Toluene, DBP and paraben-free - and made in New York, NY with the best raw materials. Color Club products are never tested on animals. Color Club is available in over 95 countries worldwide. Come join for the latest in Color Club!